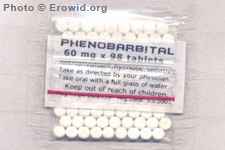 Barbiturates are a class of sedative drugs prescribed for anxiety and insomnia. Barbiturates were widely available on the street in the 1970s and '80s, though less so in the '90s and '00s. What substance does the slang term "reds" refer to? What are "Red Abbots" and "Green Abbots"? What is in a tablet labelled "MIA 110"?